This is the second book I’ve read (Riddley Walker by Russell Hoban was the first) that focused on the traditional Punch and Judy show. That one was disturbing because it’s post-apocalyptic, and written in a language that is not quite English and is very difficult; this one is disturbing because it’s Neil Gaiman and Dave McKean. Both are disturbing because Punch and Judy? That’s one messed up story. So the basic plotline, if you can call it that, of the traditional Punch and Judy puppet show follows the story of Punch. Punch is a sinner: a violent, horny, drunken lout who is clever enough and evil enough to get the better of everyone else in the show – if by “get the better” we mean “beat to death with a stick,” which is basically what Punch ends up doing to everyone, including Judy, who attacks Punch after he throws their baby off the stage to its presumed puppety death. 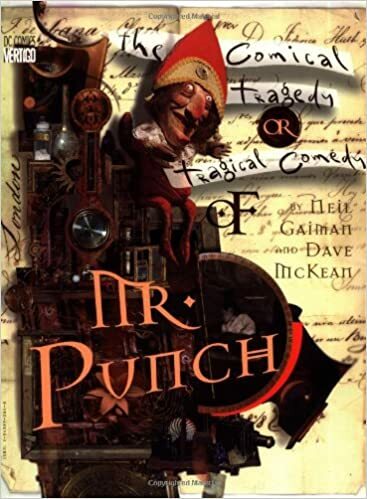 Punch also murders a doctor, a police officer, a crocodile, and the Devil himself; I assume there are variations performed by different people, but both novels tell the same basic story about the murderous Mr. Punch. Both also describe the traditional puppeteers who tell the story. They are strange people, with an unhealthy and almost religious, even zealous, respect and devotion to the show, especially to Mr. Punch himself. In Russell Hoban’s book, the Punch puppeteer is still doing the same story from medieval England, even though the book is set hundreds of years after the nuclear holocaust that wiped out our civilization; all that remains are some broken fragments of language (the book is written in a very strange invented patois), some relics and buildings and such, and the Punch and Judy show, which is retained in exactly the same form. In this one, the puppeteer seems to be mystical, in that he talks about an old man, one of the other characters, as having been his apprentice long ago, which would make the puppeteer unnaturally long-lived, it seems. Though it’s hard to say, because the story is told from the point of view of a young boy with a strong imagination, and there are other elements of almost magic realism: the main setting is in a carnival at the seashore in England, and the narrator’s grandfather (the one who used to be the puppeteer’s apprentice) has employed a woman to perform as a mermaid, sitting in a costume on a rock in an indoor pond, brushing her hair and singing. The boy takes her as a real mermaid, so maybe the longevity of the puppeteer is imagined, too. But there’s also the puppets. The puppeteer talks to the boy and tells him about the Punch show, and he seems to imply that once you put the puppets on your hand, then you gain secret knowledge – and lose something, as well, mainly the ability to take the puppets off again, metaphorically, at least. The boy puts on the crocodile puppet and comments on how magical it is that a puppet can come to life once your hand is inside it; the puppeteer offers him the Punch puppet – the one that is the key to the show, and the only puppet that never comes off the hand, as the Punch and Judy show is a one-man act, so there are never more than two puppets on stage at a time (And the narrator points out that this helps to explain all the murders, as the puppeteer has to keep getting rid of the left-hand characters so he can introduce a new one), and one of them is always Mr. Punch. Who, after he kills another puppet, says, “That’s the way you do it!” Freaking weird. And this is a children’s entertainment. I think knowing that he grew up watching Punch shows helps to explain Neil Gaiman, and maybe a lot of other English authors and creatives. To add to the weirdness, the book is not only about the Punch puppet show; the boy’s grandfather is losing the last vestiges of his sanity, and also about to lose his carnival house, since nobody goes to the seashore to go inside and see a sad mermaid or a weirdass Punch show. The boy is shy and awkward, and not treated well by his maddening grandfather; there is also some tension between the grandfather and his brother, who helps out with the show and who has a hunchback, though the reason for his deformity is a bit of a mystery commented on by the narrator. There is also an unfortunate love affair involving the mermaid girl, though the boy doesn’t understand it and so neither do we, since the story is told from his point of view. Overall, it is strange and depressing, but also utterly fascinating, like most Neil Gaiman books. And if there were no other reason to read this graphic novel, it would be worth it just for the art: because Dave McKean is a freaking genius, and the way he mixes painting and drawing and collage and photography in the images of this book make the entire experience twice as fascinating as it would be without him; and it’s fascinating enough already. Highly recommend, though with a warning about the creepiness and the sadness, which is not resolved neatly at the end. Like life.